My Aunt sent us a variety of aromatherapy items a few weeks ago - lavender bottles, Thieves, a handbook, and many other small items. She told me to try rubbing a drop or two of lavender on my feet to help me sleep. The scent reminded me of the Relaxation Blend from Teavana that I used to make in the evenings. It's no wonder - that tea includes lavender! Together with the guidebook, my Aunt sent us 2 bottles of the single oil lavender and these blends: Thieves, Valor, Joy, White Angelica, and Fun. I learned that essential oils are extracted from plants and can be applied through diffusion into the air, topically on the skin, or other means depending on the oil. Different oils are said to help in various ways, like herbs. I know that raspberry leaf extract and rooibos tea have been a blessing at times when I've been in pain from inflammation. I wonder if essential oils could make life more pleasant, too? I like the scent of lilac, but didn't see this listed; so I asked an aromatherapist on Twitter what oils have a similar sweet, floral scent. She recommended Ylang Ylang, Lavender, and Geranium. 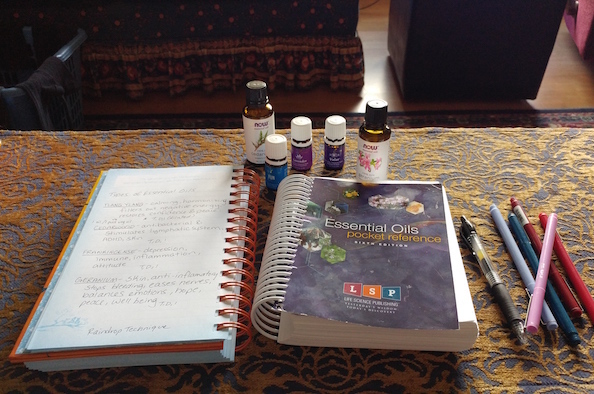 I started by reading about the history of aromatherapy and how to use them safely. Then, I made a list of the health issues that I wanted to address, to see if any of the oils might be more beneficial than others. These kept coming up: Cedarwood, Frankincense, and Lavender. I also had Geranium marked in one or two cases. 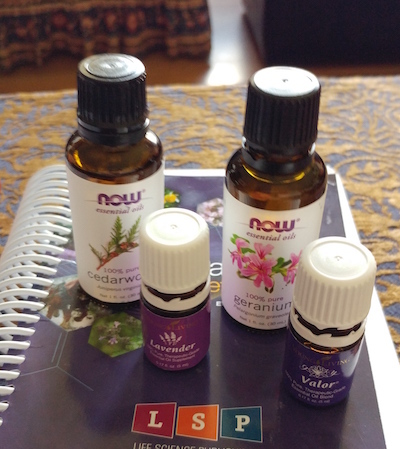 I think I'm going to start by focusing on exploring these four essential oils. I'll probably use the lavender and frankincense at night and the cedarwood and geranium in the morning. These four oils can be applied topically to the skin in small amounts, so that's probably what I'll do. I need to be careful about using them, since I don't want to irritate those around me. I probably won't be able to diffuse them into the air, but I've been reading that some people sell clay or lava rock items that absorb the scent, like my special clay tea tumblers, so maybe I'll experiment with some of those, too.